S I G N & D I G I T A L G R A P H I C S • March 2018 • 57 effect you want (see Figures 12A, 12B). 7) Choose Filter > Filter Gallery > Artistic > Plastic Wrap and use these set- tings: Highlight Strength 4, Detail 10, Smoothness 15. Do not click 'OK' yet as we are going to apply few more filters. 8) Click on the New Effect Layer icon again and choose Paint Daubs. Brush Size 3, Sharpness 5, Brush Type - Simple. 9) Once again click on New Effect Layer icon. Then click on Texture folder and select Texturizer. Texture Canvas, Scaling 100%, Relief 4, Light Top. 10) Again click the new effect layer icon and choose the 'distort folder'. Select Glass from the menu. Distortion 2, Smoothness 4, Texture - Frosted, Scaling 50%. Click OK. 11) Next, we'll enhance the strokes by embossing a copy of the layer. Duplicate the original layer. Convert it to a smart object. Place it above the Oil Paint layer. Go to Image > Adjustments > Black and White to desaturate the image. 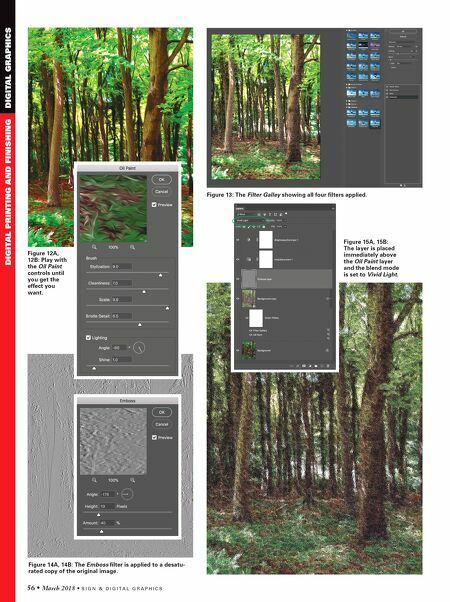 12) Choose Filter > Stylize > Emboss Angle 180 degrees, Height 7 Amount 40 (see Figures 14A, 14B). 13) Change the blend mode to Vivid Light (see Figures 15A, 15B). 14) Because you converted your layers to smart objects you can go back to make adjustments and tweaks by clicking on Filter Gallery under the smart filter mask. If you want more detail, reduce the Glass filter settings, or play around with each filter to get the best possible results. Tutorials Painting on a computer is all the rage these days. Many illustrators have aban- doned their paint boxes and brushes and work exclusively on computers primarily because it is so easy to make changes at any time during the workflow. The simu- lated effects of wet media based artwork can be extremely convincing. It's really irrelevant which software you use. The freebees certainly offer enough to get you started and the big packages are an entire art store in a box. You can find dozens of tutorials online that produce other types of oil painting effects using additional filters and brushes. There are also tutorials for watercolor, marker and even fresco effects. Researching information and exploring new methods always pays off and painting on a computer is fun and satisfying. As usual, I encourage you to experiment with different techniques that combine multiple filters, brushes and colors. SDG Many illustrators have abandoned their paint boxes and brushes and work exclusively on computers. 44in SureColor ® SCF6200PE 64in SureColor ® SCF7200PE 64in SureColor ® SCF9200PE Wensco is proud to be an authorized Epson ® Dealer. Call for more information! SCHEDULE A DEMONSTRATION TODAY! 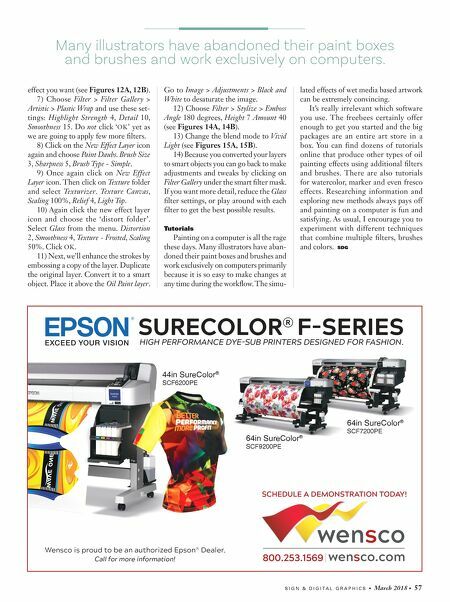 SURECOLOR ® FSERIES HIGH PERFORMANCE DYESUB PRINTERS DESIGNED FOR FASHION.